Best practices in education can be ephemeral or dismissed as old practices in new clothing (titles, jargon, rationale). H owever, I believe it is important to develop, and periodically reflect upon, one’s own educational philosophy and repertoire. To this end, I consider the values of student options and choice, content variety, skill development, and frequent student- teacher interaction to be valuable qualities in secondary social studies and history classrooms. To find the best instructional practice which synthesizes these educational aspects is not difficult. 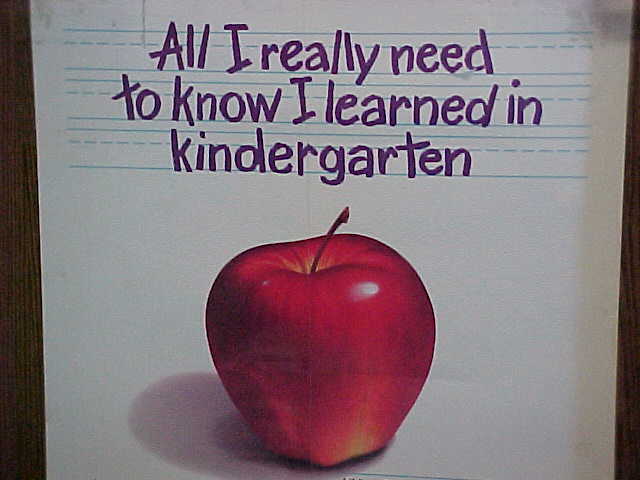 In fact, all we have to do is look in our past – to kindergarten. 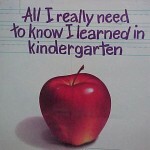 Well, maybe not everything was learned, and certainly not just in kindergarten. The point is that the instructional practices on the “Buffet of Learning Experiences” menu (Station/Rotation and Learning Zones) are staples in elementary schools, common in middle schools and (unfortunately) endangered/extinct in high schools. The typical responses when asked about there absence in high schools have claimed teacher control issues, preparing students for college teaching, and lack of space. What’s more, when I see these approaches used in high school, the classes are marked by a dynamism and engagement which are indicative of great teaching and learning. Just take a look at what can be learned at a buffet! The two models described below require an intentional and dedicated level of planning, flexibility, and knowledge of content. 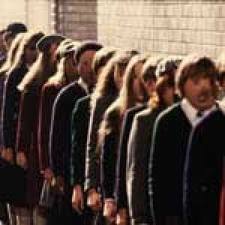 Moreover, teachers have to be willing to decenter themselves a bit. Total control and the idea that they are the center of all content knowledge is anti-thetical to these practices. Teachers are still “in control” of the class, but not the lecture, power point “you need to know this from me” control. 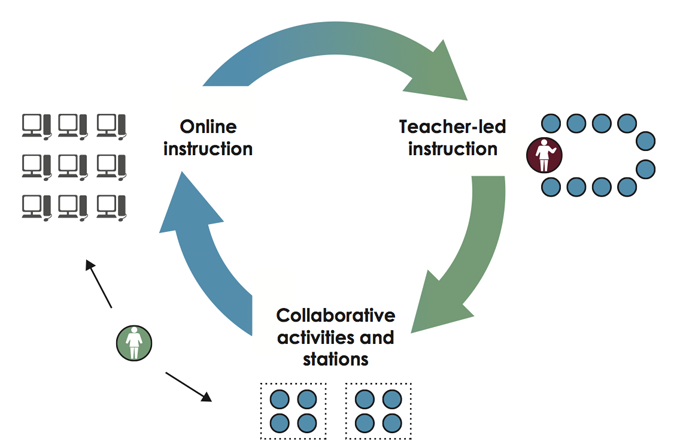 Using Station/Rotation and Learning Zones elevates the role of the teacher to instructional designer, learning facilitator, and content resource. Lastly, it is important to note that these instructional practices should be done frequently and not treated as rare events or the alternative. Station/Rotation and Learning Zones builds a learning culture that celebrates student accountability, investigation, collaboration,. communication, creativity, and critical thinking (sound familiar?). These are all great things in education. Eat up and come back for more! …to an active learning environment. Checkout the two models below. What would you change? How many stations would you have? How big are the groups? Textbook Use Area – Students read, review or engage with sections of the textbook. Writing/Editing Area- Students write, self -edit, peer edit, practice a writing skill. Computer Area – Especially good if you have limited computers. Explore a website, research etc. Teacher Feedback Area- Feedback on projects, grades, National History Day work etc. Needless to say, keep in mind that directions at each area should be clear and doable in the time allotted. Teacher’s need not have their own station and can be on call as needed. Lastly, be sure to identify the outcome of each station – this is the accountability part! For more information on the Zone approach checkout: Bray and McClaskey “Six Steps to Personalize Learning” Learning and Leading. ISTE. May 2013 Issue. Their website is located here. Consider reconfiguring the zones in the model above as activity stations from the list above and you have created a whole new buffet menu! What is your classroom like? Is it inspiring? Welcoming? Do you display student work and opportunities? Does it show expectations and goals? Avoid unnecessary congestion in high-traffic areas. Consider potential distractions: windows, doors, etc. Always have a clear view of students. Verify that all students can see you, instructional displays (e.g., chalkboard) and daily assignments (weekly, if possible). Use walls and bulletin boards to display rules, procedures, assigned duties, a calendar, schedule, student work and extra-credit activities. 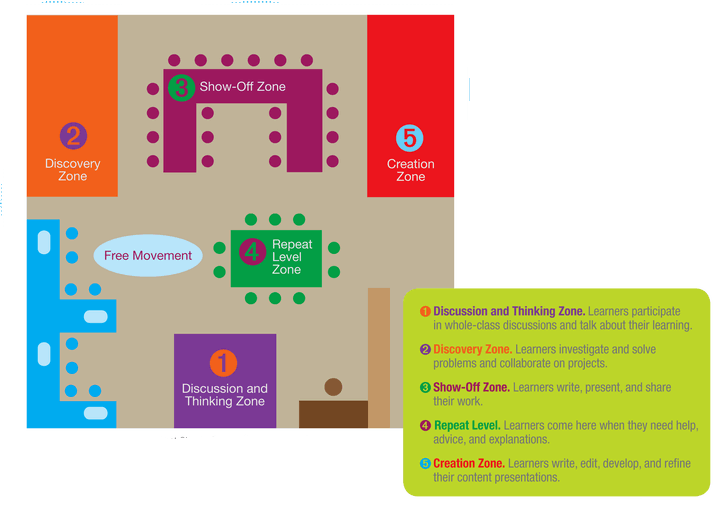 Place learning areas so students can move from one to another with little or no disruption. Leave walking space around students’ desks. Place storage space and necessary materials so they are easily accessible. Arrange students’ desks in rows facing instructional areas until you’ve learned their names, work habits and personal traits. Check all electrical equipment to be sure it works and learn how to use the equipment before using it in class. 1. Where will your desk be? 2. How many student classroom desks do you need? 3. What classroom seating arrangement of the desks will you use; for example, groups,rows, U shapes, rows but in groups,etc? 4. Will you have any classroom computers? Where will you put the classroom computer tables? 5. Will you have a carpeted area, away from the students’ desks, where you can all come together for classroom meetings,etc.? 6. What other additional classroom furniture such as filing cabinets, bookshelves,working tables will there be? 7. How many classroom bulletin boards will you have? 8. What other classroom display ideas are swimming around in your head? This entry was posted in Instructional Practices, Online Education, Professional Development, Web 2.0. Bookmark the permalink. 12 Digital History Projects That Will Make You Say WOW! Summering with Shulman: What did you add to your (T)PCK Repertoire? Assignment Writing Help on Global Education Resource Clearing House – New Things Under the Sun! Assignment Writing Services on Global Education Resource Clearing House – New Things Under the Sun!